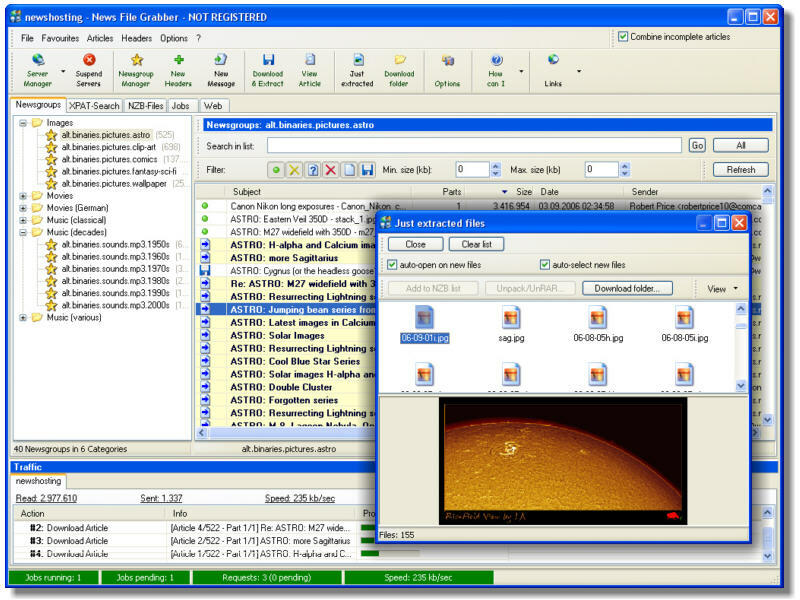 ...... News File Grabber has a built-in XPAT-Search, supports NZB-files and can unpack RAR-files. You can post articles (also with files attached) as well as extract from EML/NWS-files stored on your hard disk. You do not need HJSplit in order to combine .001-, .002- ... files. The integrated Newsgroup-Manager lets you manage your favourite newsgroups, grouping them by categories for a better overview! With the Job-Manager you have all of your jobs under control! You can see all running, pending and already finished jobs. You can interrupt and resume jobs as well as cancel or immediately start jobs. The Job-Queue will be saved automatically. News File Grabber is provider-independent and works with all common usenet-providers! - Already proven thousandfold! Qweas is providing links to News File Grabber 4.6.0.4 as a courtesy, and makes no representations regarding News File Grabber or any other applications or any information related thereto. Any questions, complaints or claims regarding this application News File Grabber 4.6.0.4 must be directed to the appropriate software vendor. You may click the publisher link of News File Grabber on the top of this page to get more details about the vendor.